Gender pay inequalities may be making the headlines, but the UK’s “disability gap” – the poor rate of employment and retention in employment for people with disabilities – remains stubbornly high. Paul Avis looks at what can be done. Diversity in the workplace has never been so hotly debated. Now that large UK companies (or those with 250 employees or more) are obligated to publish data on the gender pay gap, the discrepancies between male and female pay – and imbalance of men and women in senior roles – is set to dominate headlines for the foreseeable future. But another diversity issue is bubbling quietly under the surface, and while it may not be attracting as many headlines, it is just as deserving of our attention. The unemployment rate is currently at its lowest level since 1975. But not all workers are benefiting from high levels of employment – while 80.6% of people without disabilities are employed, this falls sharply to 49.2% of those with disabilities. Though the employment rate for people with disabilities has improved very slightly year-on-year, with an additional 104,000 disabled people in work, there is still plenty of work to be done. The Government has recognised this and towards the end of last year set out a target of one million more disabled people in work by 2027. So what role can and must employers play in the Government’s ten-year programme of change? The Government’s paper Improving lives – the future of work, health and disability sets out a clear mandate for employers, manager and supervisors to improve recruitment and retention of disabled workers, better manage employee ill-health, create healthy and inclusive workplaces where all can progress and provide opportunities for workers who need a more flexible approach. Employers should take this as an indication that they are obligated not only to prevent direct or indirect discrimination against disabled employees (both of which are illegal under the 2010 Equality Act) but also to take active steps in improving working conditions and opportunities for those with disabilities. 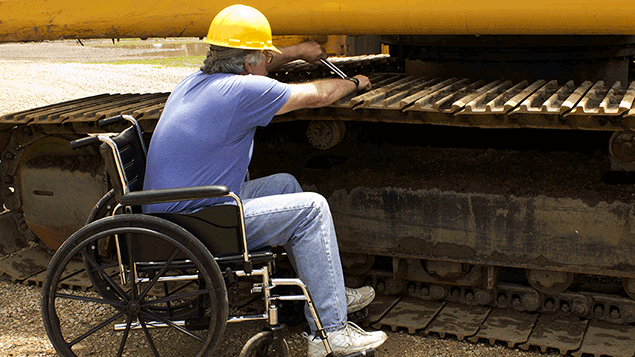 One of the most common forms of discrimination is failing to make necessary adjustments for disabled employees. It is often perceived that it is expensive to make the changes needed to support a member of staff with a disability, but in most cases the opposite is true. Offering flexible working, making slight changes to the dress code or allowing a colleague to sit/stand are all effective forms of support but cost nothing to implement. Other changes include providing a lift or ramp or equipment which is suited to the individual, such as a special keyboard or louder phone. According to The Disability Rights Commission, the average cost of adjustments is just £75. Employers should be aware they are legally required to make reasonable adjustments to the working environment provided the employee has informed them of their disability and they are classified as disabled under the Equality Act. While the obligation to make adjustments lies on the employer, and employees do not necessarily need to provide suggestions, each individual may experience their disability in a different way so it’s important they have the opportunity to discuss with their employer what kind of workplace changes would be most beneficial. If an individual requires assistance which is too expensive for an employer to reasonably implement, support is available from the Government’s Access to Work scheme. This can include a grant to help cover the costs of practical support in the workplace. Advances in technology mean there is little excuse for employers not to offer a disability-friendly workplace. The Improving Lives paper points to “accessible hardware and software…through to developments in apps and wearable technology” with “small innovative start-ups and large technology companies” already implementing these solutions for their employees. As technology continues to improve, assistive technology should become more widespread in UK companies. At a basic level, the availability of online meeting and conference call centres has enabled home-working for many types of employees. More sophisticated software – such as computer screen readers which read the content of computer screens to visually impaired users, and speech recognition programmes to aid those with motor skills problems – can make a real difference to disabled people’s job opportunities and the likelihood of them remaining in the workplace. Becoming newly disabled is a very difficult situation and can become even worse if an employer is quick to write off an employee rather than helping them return to work. This leaves the employer without an experienced member of staff and needing to recruit a replacement, with an average associated cost of more than £30,000. More importantly, the employee is left without their job, potentially resulting in them struggling to support themselves and their family. 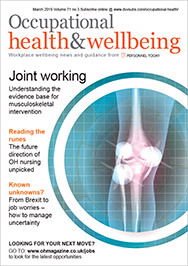 Employers might feel that managing the health issues of their staff is too complex and costly. This is where Group Income Protection (GIP) products can make a real difference. Designed to provide an employee with financial support if they are off work due to a long-term illness or injury, the product ensures staff still receive an income as well as remaining entitled to valuable private medical and death benefit schemes. A host of additional support services are also offered by insurers alongside a GIP scheme including employer helplines, second medical opinion services which support clinical certainty and vocational rehabilitation. Claims management services will provide a medically-endorsed return to work plan as well as look at adjustments and adaptions to the workplace to achieve a return to work as soon as is suitable. Particularly beneficial outcomes are achieved when employers engage with early intervention services – when an employer uses such a service, 90% of employees will make a successful, sustainable return to work after seven weeks, removing the need for a claim payment and helping to keep employers’ premiums low. Given that GIP can be provided for as a little as £75 per employee per year for basic cover, it is a low-cost, effective starting point to help manage and prevent sickness absence and help those who find themselves ill or injured and needing assistance to return to the workplace. This makes it an invaluable tool for businesses looking to ensure they are truly diverse and supportive of disabled staff. 1. To enable persons with disabilities to live independently and participate fully in all aspects of life, States Parties shall take appropriate measures to ensure to persons with disabilities access, on an equal basis with others, to the physical environment, to transportation, to information and communications, including information and communications technologies and systems, and to other facilities and services open or provided to the public, both in urban and in rural areas. Although many countries have ratified this paper there is little being done to protect the health of these people. Despite the legal ramifications for employers. Lloyds of London do not cover RF liability. Their general insurance exclusions include Radiation in Clause 32. https://tinyurl.com/create.php? It’s a functional impairment the result of an imperfect environment and has recognition in Accessibility and inclusion for employees, people in communities or schools and universities. Recent lectures on responsibility of employers point to liability becoming a bigger issue. While technology should be accessible to all, that means hard wired in an inclusive and SAFE workplace. This would include provision for hardwired phones and other technology in the vicinity of the individual. Preventing inclusion for teacher’s harmed and children sensitised is listed here on the UN’s website calling for submissions on Inclusive Education: .